You see them everywhere. Small labels attached to your products at the grocery store, Walmart or big box store that allow you to peel them off and save money at check out. Weber prints many of these type of labels and in this blog we will feature two examples of "Point of Purchase Coupon" labels. These labels are perfect for adding to packages like boxes, clamshells, bottles, and bags to give your customer a discount or rebate buying incentive. It's a good way to get your product noticed or to entice a potential buyer into trying your brand for the first time. Two of the most common types of coupon labels are the extended-content, multi-panel construction label that works best for mail in rebates that requires more space for text and the simple peel off coupon with deadened adhesive on the back. 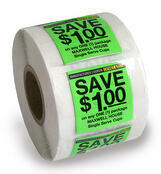 The peel-off coupons are usually collected at check out and the savings are immediate. There are two basic ways to apply your new coupon labels. The method you use is dependent on whether your products are on the manufacturing line or already offline or in-store. When your products are already at the store or at the warehouse, you can apply the labels by hand (labor-intensive!) using an affordable hand-held labeling tool. We would recommend something like the Towa hand-held labeler. Available in six different sizes, the Towa is perfect for small labeling jobs and on-demand labeling. If you plan to use a hand-held labeler to apply your coupon labels, remember that your labels need to be wound on a 1" core and the roll has to be no more than about 5" in diameter. This method is labor intensive because you have to swipe the labeler on each product, one at a time. If you have a lot of items to label, this could take a while! If you plan ahead and can label your products while still being manufactured on a conveyor line, you can use one of the many labeling systems on the market. 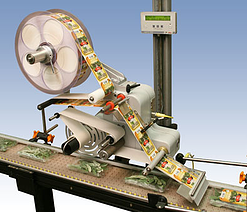 We would recommend either a PackLeader labeling system or a Weber Alpha Compact label applicator. Automated labeling methods like this are meant for high-volume labeling that also requires close accuracy (like your coupon label). Depending on the shape of your product and the speed of the line, you can choose from a range of systems including the PackLeader 501 for round containers like beverages or the Weber Alpha Compact which is perfect for applying labels to the top or sides of a product. Both systems are economical yet full of advanced features like rugged die-cast aluminum construction, single-key calibration, automatic recognition of missing labels, in-production speed adjustment, and more. 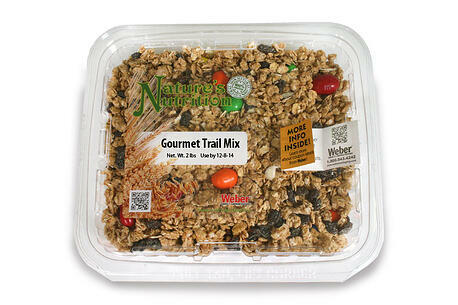 An example of a tricky application is this coupon label applied to a clamshell plastic container filled with trail mix. The clamshell lid is recessed so the label needs to be blow onto the top of the clamshell using a Alpha Tamp-Blow labeling system. The label is brought to within a 1/4" of the product (clearing the lip) and is then blown onto the lid. To get more information on the Weber coupon labels or the equipment to apply them, contact a Weber expert using the link below.